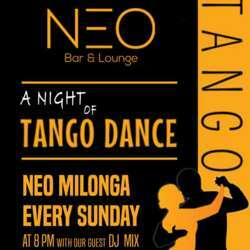 Neo invite you to Weekly NEO MILONGA NIGHT to Free your soul, Give embrace, get love & spread peace. A- Membership Cardholders will enjoy free entrance and no need for reservation. B- Regular customers can enjoy spending L.E Protected content person as a minimum charge. C- Individual's Entrance fee is L.E Protected content person including 2 free drinks (1 Soft drink and 1 Alcoholic drink) OR (1 Soft drink and 1 Set menu dinner), Regular customers will be exempt.